Home » Events » 7-12-2014 Our 3rd Anniversary Picnic! 7-12-2014 Our 3rd Anniversary Picnic! Join us as we celebrate the third year of Friends of Glen Providence Park! 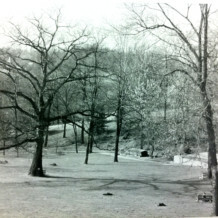 It’s our 3rd Anniversary Picnic, and this year we will celebrate at the picnic area on the sledding hill, under the centuries-old White Oak tree. Bring your stories and memories about the park, and join us for cake, lawn games, and fun! We’ve been busy since our first meeting at Seven Stones Café on July 14, 2011 – with stewardship, advocacy, citizen science and historical research, plus 10 volunteer events, 22 nature walks and 5 concerts! So once a year, we like to kick back for an anniversary celebration, honoring a decades-long tradition of picnics in Glen Providence Park. We ask that you RSVP, so we know how much cake to order! Just email us at FriendsoftheGlen[AT]gmail.com. If the weather is questionable, a rain date decision will be posted by 10:00am that Saturday. At past picnics, people jumped rope and played bocce, Frisbee, and other lawn games – so be creative! Pack a picnic basket with a lunch, and if you’d like, a dish to share. A picnic blanket, and perhaps bug spray. Your stories and memories about the park! Scouts in Glen Providence Park! 7-13-2013 Our 2nd Anniversary Picnic!